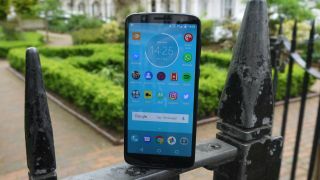 The Moto G range has long offered some of the best budget handsets available and the Moto G6 and Moto G6 Play are no exceptions. Both scored well in our reviews, but despite both having G6 in the name they’re actually quite different handsets and come at different price points. With that in mind we’ve created this guide, highlighting where they differ and where they’re the same, so you can get a clear picture of which is the best choice for you. While at first glance these two phones might look quite similar, with bezels above and below the display and a circular camera housing on the rear, that illusion is shattered as soon as you pick them up. While the Moto G6 has a glass back, the Moto G6 Play has a plastic one, though both phones have a metal frame. There are some clear visual differences too though, as for example the Moto G6 has a fingerprint scanner below the display, while the Moto G6 Play houses its scanner on the back. Their dimensions and weights also differ of course, with the Moto G6 coming in at 153.8 x 72.3 x 8.3mm and 167g, while the Moto G6 Play is 154.4 x 72.2 x 9mm and 175g. It’s a small difference then, but the G6 Play is marginally longer, thicker and heavier, and that’s despite having the same size screen, which we’ll get to below. Ultimately though these two phones have a similar look, but the Moto G6 is clad in more premium materials – as you’d expect given its price. Note also that the Moto G6 has a water-repellent nano-coating (which should help it survive a splash but doesn’t make it safe to dunk), while the Moto G6 Play isn’t listed as having any water resistance. Both the Moto G6 and the Moto G6 Play have 5.7-inch IPS LCD screens with an 18:9 aspect ratio, but that’s mostly where the similarities end. The biggest difference between the two displays is that while the Moto G6’s is 1080 x 2160 (for a pixel density of around 424 pixels per inch), the Moto G6 Play has a lower 720 x 1440 resolution, giving it a pixel density of roughly 282 pixels per inch. So the display on the Moto G6 Play is nowhere near as sharp and it’s also not as tough, as the standard Moto G6 has Gorilla Glass 3 protection, while Motorola doesn’t list any Gorilla Glass for the Moto G6 Play. Gorilla Glass 3 isn’t the latest version (it’s up to 6) but it’s a lot better than nothing. We noted in our review that color performance on the Moto G6 Play is also slightly worse than on the Moto G6, but concluded that overall it’s still a good screen for the price. Both the Moto G6 and Moto G6 Play run Android Oreo and the software is close to stock Android. Motorola has also confirmed that both will be getting updated to Android Pie at some point, so there’s no real difference here. There is a difference in their power though, as while the Moto G6 has an octa-core Snapdragon 450 chipset clocked at 1.8GHz, the Moto G6 Play has a slightly lower end octa-core Snapdragon 430, clocked at 1.4GHz. And that assumes you’re not in the US, if you are then the Moto G6 Play comes with an even lower-end quad-core Snapdragon 427 chipset, clocked at 1.4GHz. There’s also potentially more RAM in the Moto G6, as you can get the phone with either 3GB or 4GB, while the Moto G6 Play comes with either 2GB or 3GB. So you can expect speedier performance from the standard Moto G6, which also makes it a better choice if you want to play 3D games or do other demanding things with your phone, though in our reviews we found that both handsets offered solid performance for what they cost. Another thing to consider is storage, as while the Moto G6 Play only comes with either 16GB or 32GB, the Moto G6 can come with either 32GB or 64GB (though that latter size is an Amazon exclusive). Not long ago dual-rear cameras were the preserve of flagships, but now lots of phones have them, including the Moto G6, which has both a 12MP f/1.8 lens and a 5MP f/2.2 one. This of course allows for the ever-popular portrait mode, which can blur the background of shots. The Moto G6 Play though has just a single-lens camera, specifically a 13MP f/2.0 one. So it’s less versatile and it’s not as good for video either – the standard Moto G6 can shoot in 1080p at up to 60fps, while the Moto G6 Play tops out at 30fps. There’s also potentially some difference in the front-facing camera, as while both phones have an 8MP snapper in most markets, the US gets a 5MP camera on the front of the Moto G6 Play. As for the battery, that’s a rare area where the Moto G6 Play actually comes out on top, as it has a 4,000mAh one, while the Moto G6 has just a 3,000mAh one. In our tests the bigger battery did unsurprisingly deliver longer life, though in both cases you’ll likely be charging the phone daily. Fortunately, they both support fast charging, though note that while the Moto G6 uses USB-C, the Moto G6 Play is lumbered with an older micro USB port. The Moto G6 is of course the pricier of the two phones, but it’s still quite an affordable handset, coming in at $230/£200/AU$399, while the Moto G6 Play starts at $200/£150/AU$329. In both cases those prices are lower than they started at in some regions, but the upshot is that you’ll be paying up to around 25% more for the Moto G6 than the Moto G6 Play. In short, the Moto G6 has a sharper screen, a higher-end build, a bit more power, an extra camera lens and potentially more storage than the Moto G6 Play, but its battery is smaller and it costs more, while the screen size, software and general look of the phones is similar or identical. In our reviews we gave the Moto G6 the edge, awarding it 4.5 stars, while the Moto G6 Play got 4 stars, but those are both great scores, so you shouldn’t go wrong with either for what they cost.